I looked around on line and found some information about a green power wirer for the heater switch. Near as I can figure, the power of the heater switch is a green wirer that goes from the fuel gauge to the switch. I assume the wire would go over the top of big gauges and onto the fuel gauge, but I guess the wire could go along the bottom of the dash. Does this sound correct? Sounds good to me. I routed high so it would never start to "hang down"! The Drawing I have shows the heater supply coming from "A2" on the fuse box which is live all the time. To prevent me from accidentally leaving the heater on and draining the battery I added a relay that is powered by the ignition switch supply. So the heater can only be on when the ignition is on. FWIW, that connection does not match any of the factory information I have. The TR2 workshop manual makes it clear that the heater is to be controlled by the ignition switch. It is my opinion that the author of that diagram simply got it wrong. I was looking at the drawing by AUTO-WIRE. Thought it was accurate. Yes, I know. That's the only one that shows the connection to A2. The factory diagrams don't show it at all, but the text in the workshop manual says to connect it to the hot side of the wiper switch, which is controlled by the ignition switch on earlier cars. On later cars, I believe it was connected to the hot terminal on the fuel gauge, which again is controlled by the ignition switch and protected by the fuse. There are a few other minor details on that diagram that aren't right, but it's pretty close. The fellow that originally produced it did not own a TR3A, and apparently was just condensing information from the manuals. The preliminary version he sent me for review said only "Where does this connect" He sold Advance AutoWire shortly after that, IIRC he had some health issues and wanted to spend more time with his grandkids. Yeah, that "A2" connection appears in the Advance Auto Wire schematic. This car is TS 27036 so it is kind of early. I like the idea of the wiper switch because that switch is closer to the heater switch, but the fuel gauge already feeds that switch, so it really would not matter much. Those little tiny nuts on the fuel gauge are becoming more of challenge for me and they are probably hard to find, and the wiper switch has the lug for the wire, so that could be a plus. I need to dive in and see. TS27036 should have the later wiper motor, which means the wiper switch is grounded rather than being fed from the green circuit. Piggott gives the change point as TS12567. You could use A4 on the fuse block, if you want to. That would be equivalent. That would be much easier to get to with your connection. On my relay mod I also used it to feed a 12 Volt power outlet for GPS and a pair of USB outlets for phone charging. David & Randall got it right...Use the A4 connector at your fuse block. easier to get to. It is switched and fused which is what you want. I recently went back over my wiring harness assembly and found a discrepancy with the wiper motor and hooking up the heater. 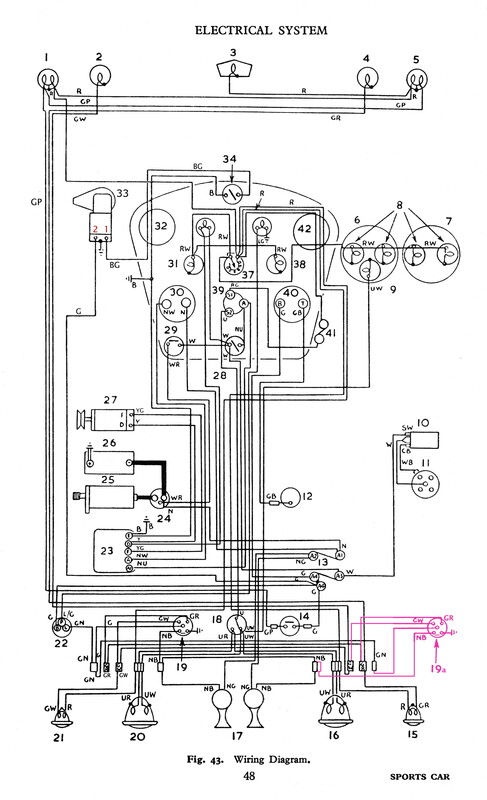 Because the car is a 1958, I was using wiring diagrams from both a tr3 and tr3a that I got on line sometime back. I googled some questions I had about the wiper switch and found an old post where Randall and Geo are helping a member with his wiring diagram. Anyways, there was a second wire green coming of the fuel gauge wiring and “hermanmaire” (the member being help) struggled where to hook this wire. I have the same second green wire about 6 inches long with a bare end on my new harness. Then it hit me this second green wirer is for the heater motor and put on at the factory. I figured the green wire was power for the wiper motor, and black and green was the other side, but when I looked into the old post deeper I saw how Geo talked about the ground wire is used for the switch on wiper motor with no power in play on the switch and Randall wrote about how only the very early tr2s used power on the wiper switch. So I hooked the heater to the second green wire on the fuel gauge wiring and hooked the other side of the wiper switch to ground. This should work. The other way I had it would have let smoke out for sure. So if you have a new wiring harness with 3 wires at the fuel gauge, the extra one if for the heater. The bummer was I had the oil gauge hooked up and center dash and the heater installed. I was able to rework the wires in place through the glove box hole, but challenging. What puzzles me is that in your photo, the "extra" wire appears to be green with a black stripe. Normally, GB would be the line from the fuel gauge to the fuel sender in the tank, and there shouldn't be anything else connected with it. I saw that; it is a shadow. The green with black is very dark and the black strip is difficult to see, and I ran that from the switch to the wiper motor. Does it matter which post the BG goes to on the motor? I put it on the bottom post because I found pictures of the GB on the wiper motor that way. Yes, it matters. BG has to go to the same terminal that the park switch (inside the wiper motor) connects to ground. Otherwise you'll blow the fuse when the motor moves. I forget offhand if that's top or bottom, but it is terminal 1 (which should be marked on the housing). 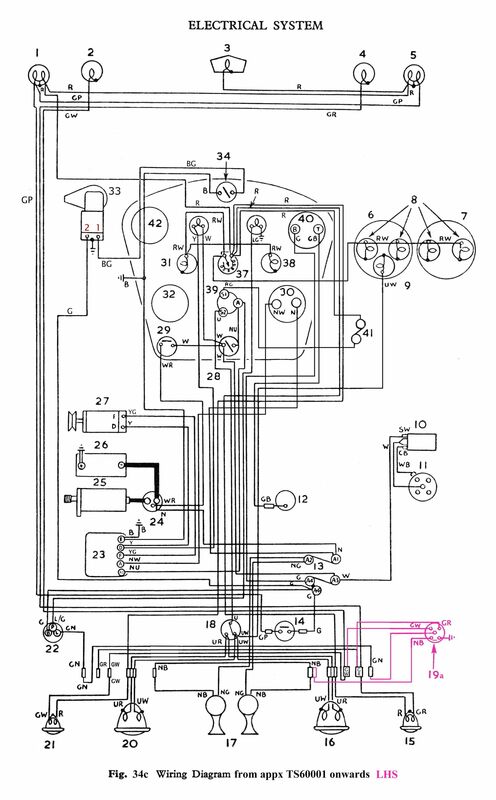 Excellent wiring diagram Randall; it is the best one I have seen. Plus thanks a lot for pointing out the 1& 2 post on the wiper motor. The one is on the bottom. None of the other diagrams show that. I believe that is the one that you edited, good job. I think I have seen it before, but now I see the diagrams value. I am getting close to a smoke test; that would have been positive for smoke if I would have used my combination of tr3 and tr3a diagram I got on line. I still need to find a way to add the ground wires for the headlights, tach and so on; but here's my latest effort. Only real change is to move the gauges into the correct position.